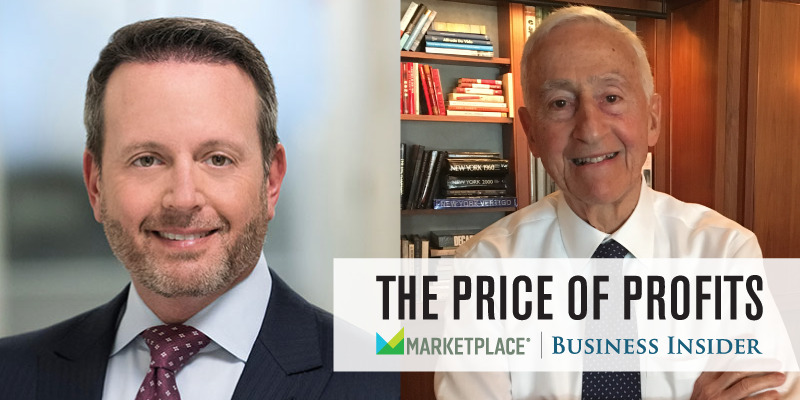 Allergan / Dan Bobkoff / Mike Nudelman / Business InsiderAllergan CEO Brent Saunders and former Merck CEO Roy Vagelos illustrate two eras in pharma. The American corporation has been transformed by globalization and new technology. But equally powerful is the belief that on Wall Street and in boardrooms the sole responsibility of a corporation is to maximise profits for shareholders. 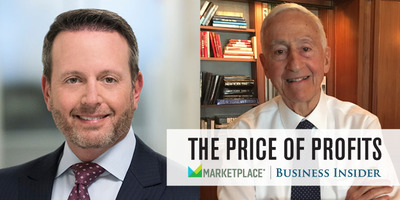 Starting this week, Business Insider teams up with public radio’s “Marketplace.” Our series, “The Price of Profits,” tells the story of how this idea changed the US and our lives. There’s a new way of doing business for most of Big Pharma. Instead of relying on their own expensive laboratories, they buy drugs or their makers, and focus on getting treatments through the FDA and onto your TV screens. Then, they raise prices every year, move overseas for tax advantages and reward shareholders by buying back billions worth of shares. 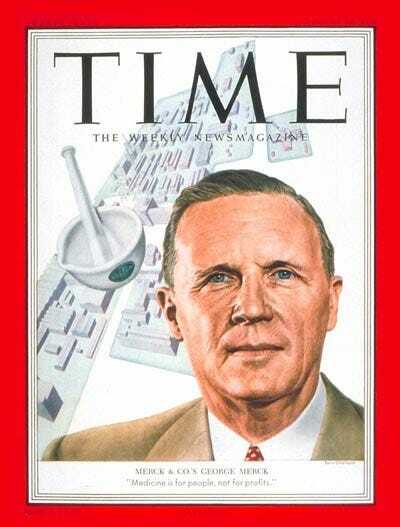 TimeGeorge Merck on the Aug 18, 1952 cover of Time Magazine. ‘Medicine is for people, not for profits,’ the cover reads. — that the mission of Merck and other pharmaceutical companies at the time, was to take care of patients and profits would follow,” said Joel Hay, a professor of pharmaceutical economics and policy at the University of Southern California. At Merck & Co., in the middle of the 20th century, the idea that patients came before profits, “was a big part of our culture,” said Scott Lucas, who worked in sales at the company for more than 30 years, starting in the 1970s. Lucas and other workers describe an era of the highest ethical and moral standards. Drug trials were halted over the most tenuous rumour that a similar drug in development by a competitor was running into issues. Sales staff took pains to educate doctors about the downsides of Merck’s treatments. In the second half of the 20th century, Merck really was a company where shareholder value was the result, not a prime motivation. It ran huge, productive research labs full of topnotch scientists. In charge of those labs was Roy Vagelos — who went from chief scientist to become CEO in 1984. By today’s standards of management, it’s like Vagelos did everything wrong. Dan Bobkoff / Business InsiderRoy Vagelos in New York in May 2016. He bailed out of business school after just a week, which is maybe why he didn’t think much about Wall Street. That’s unimaginable by today’s standards. At one point, he made a last minute decision to donate a massive quantity of a drug that cured river blindness in patients in Africa. It cost the company a lot of money. You could be cynical about this. You could argue holding down drug prices helped stave off regulations, and there were a lot of PR benefits to that donation in Africa. But by not focusing on maximizing shareholder value, Merck did really well. 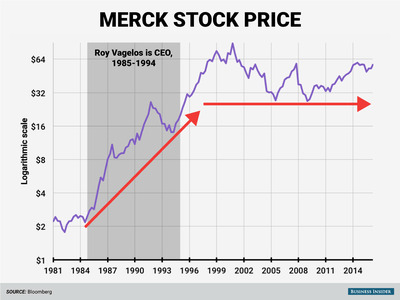 During the Vagelos era, Merck came out with lots of new drugs, which led Merck’s stock price to increase an average of 22% per year. In the years since, it has been just 5% a year. 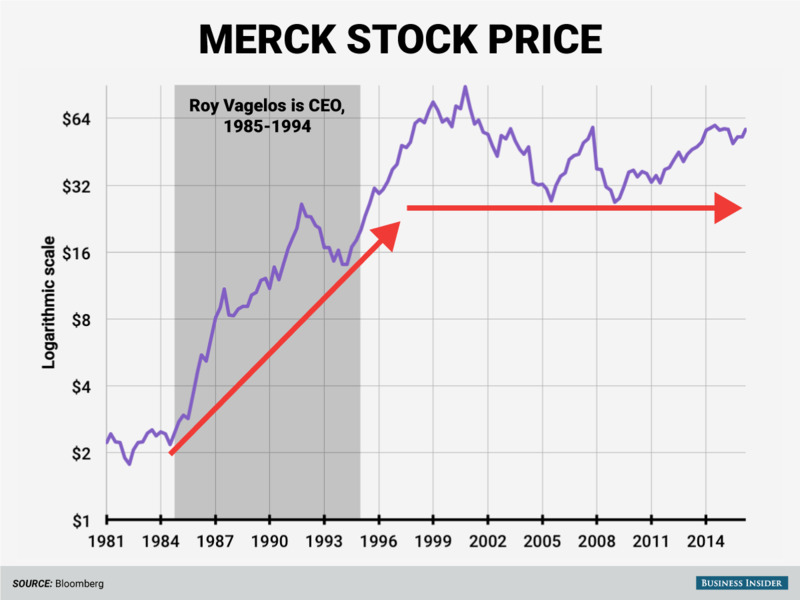 But these days, it’s just about impossible to run a company the way Vagelos ran Merck. “You have to provide a little bit of something for everybody,” said Brent Saunders, the CEO of Allergan. You might know it as the maker of Botox. Allergan is highly respected by Wall Street and its competitors, but Saunders can’t ignore investors. In many ways, Allergan is the model modern pharmaceutical company. It more often acquires drugs or companies, rather than go through the risky process of discovering and developing drugs from scratch, as companies like Merck did in its heyday. A good portion of its R&D pipeline is dedicated to finding new uses for existing drugs like Botox, which currently has 11 approved indications, and more on the way. So far it can be used for wrinkles, migraines, overactive bladders, and much more. And Saunders can’t ignore his share price, especially now that he has one of the most famous activist investors taking a big stake in Allergan: Carl Icahn. Icahn is leaving Saunders alone for now, but that could change. He has a history of pressuring companies to make moves and then getting out of the stock. To save on taxes, Allergan is technically an Irish company, even though Saunders mostly works in New Jersey. It caused a little tension between Saunders and his father when Pfizer tried to buy Allergan to take advantage of the tax deal. Saunders says that being based in Ireland allows Allergan to use the savings to invest more in the US. Then, there’s prices: Allergan says it raises prices roughly eight per cent a year — far greater than inflation, but also nothing like a Valeant, the drug company that has been the focus of investigations in to price hikes. But for all the ways Allergan is an example of the new way pharmaceutical companies operate today, Saunders sometimes sounds a bit like Dr. Vagelos. “When we do well for patients, when we come up with innovation for an unmet need, when we can improve a patient’s life by one of our treatments, our shareholders benefit,” he said. Today, Merck and other big pharma companies look more like Allergan. Their own research teams haven’t been so productive lately, so they increasingly buy up drugs and their makers. The old established companies are spending billions buying back their own shares. 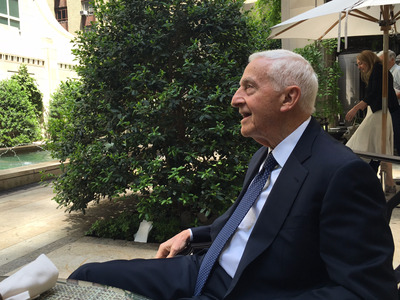 After Roy Vagelos retired from Merck, he made a fortune as chairman of the biotech firm Regeneron. What does he think of newer firms and their business models? Wall Street, though, might not agree. “The Price of Profits,” our series with Marketplace, looks at what happens when profits become a company’s product. For more, visit priceofprofits.org.